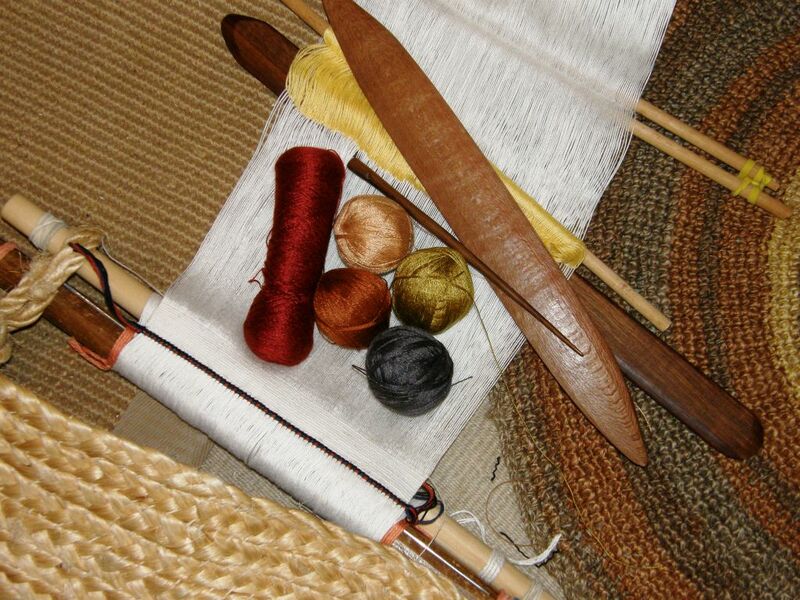 Sometimes I wonder who gets more out of my weaving get-togethers and online groups…my friends or me! I had a great trip away in the US and am now back in the loom in Bolivia. No official Thanksgiving Day celebration here but plenty to be thankful for all the same. There was just enough room in my backpack at the end of this US trip to bring back all the stuff I had stashed with one of my weaving friends after my trip earlier this year. Time has passed and now I can’t even remember what some of it is but all I know is that I already have projects in mind for each and every bit of it. Not all of it appears here in the picture! 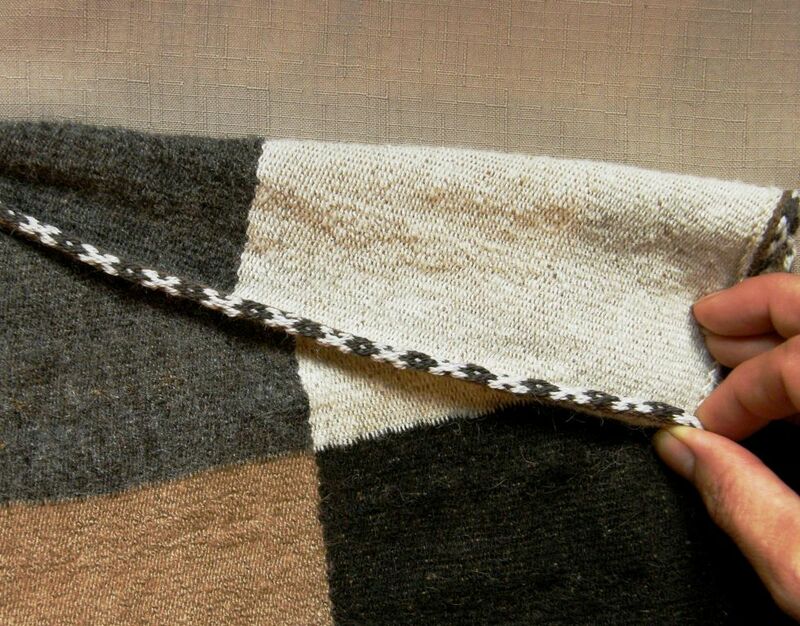 There are several large skeins of some kind of wool in natural colors for an experiment in weft substitution inspired by this Moroccan cloak which belongs to my friend Yonat…. The yarn I am re-spinning in the stash picture is Malabrigo lace-weight single which I plan to ply and also use for a ticlla (discontinuous warp) piece. The balls in the middle are hemp that Jennifer gave me when we got together last spring. I think that will be used for a pouch with an intermesh design. The cones were given to me by Susan and I have to confess that I have completely forgotten what kind of yarn it is. I hope to use it in an ikat project and will need to identify it in order to use the correct dye! Here in Bolivia the yummy silk I brought back from the UK awaits me. So, there is plenty of new yarn to play with. So, while my backpack was just big enough to stuff with yarn and some new tools, there was also just enough room left in my head to squeeze in all the inspiration, ideas and new skills. And the best part….months now stretch ahead during which I can play with all of this! It never seems to grow, does it? Most of the time it sits there just to show the various parts of the basic loom and I never actually pick it up and weave on it. I bring it home and unroll it waiting for it to tell me what it wants to be. During my trip I had more fun demonstrating on the Guatemalan looms that people brought to show me. Two people in two different groups brought in looms from Guatemala all set up and ready to go. As it happens both were from San Antonio Aguas Calientes and both had been warped in red. 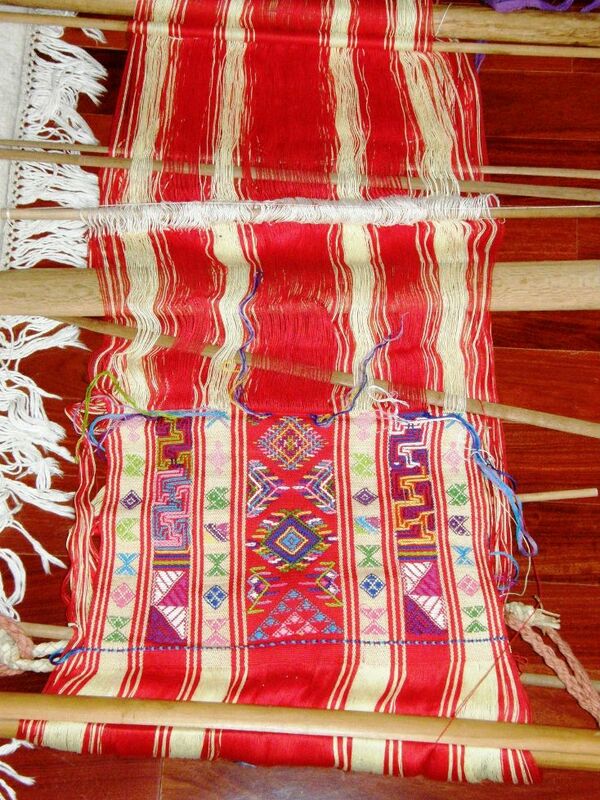 The backstrap weavers in that town decorate cloth with supplemental wefts using both single and double-faced techniques.. 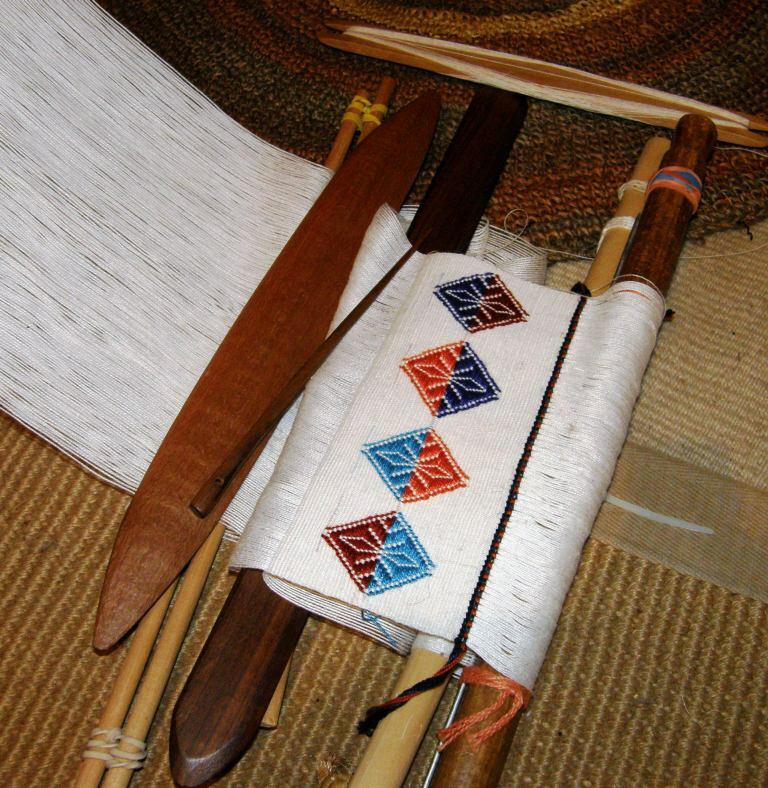 I had the chance to study there in 2008 and it was great to be able to sit in front of those warps and tinker with the familiar patterns and sticks. Not only did we have looms to play with. 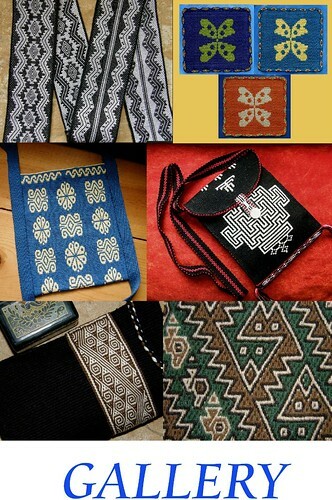 People showed me gorgeous Guatemalan huipiles too and we got to examine just a few of the many ways that supplemental wefts are used to decorate cloth in Guatemala. Red again! Are the weaving gods trying to tell me something? I left Massachusetts with Guatemalan patterns swirling in my head and, if those colors weren’t bright enough, the next stop on my trip in Massachusetts (yes, of course, I made my first visit to WEBS while there!) had me sleeping in a guest bedroom with this on the wall…. 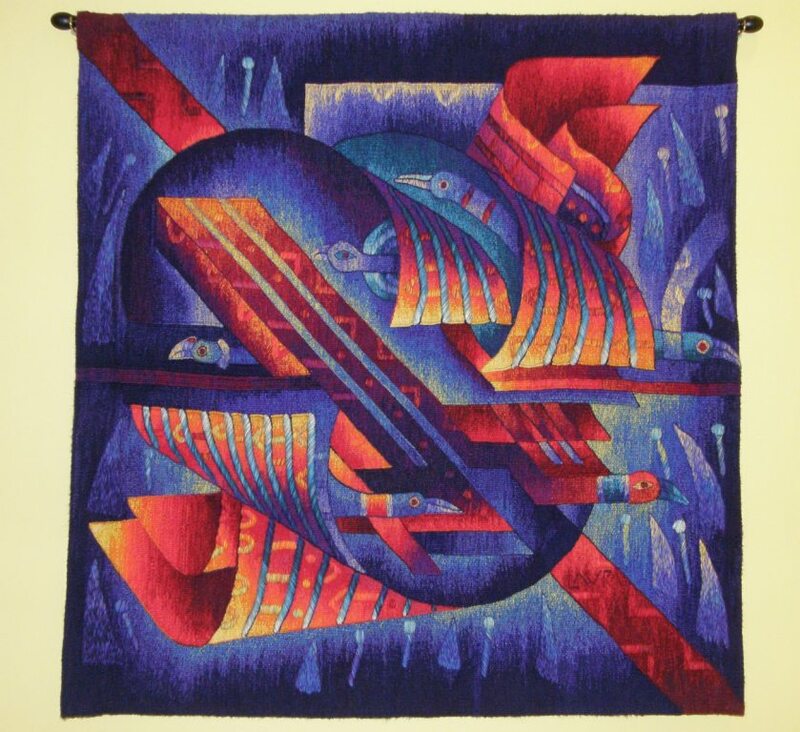 This piece by Peruvian master tapestry weaver Maximo Laura, accompanied my dreams every night! The translation of its title is “Condors Wrapped in Sacred Cloaks”. I have admired Laura’s work in exhibits from afar…online, at the National Museum of the American Indian in DC and at Convergence 2010. This time I got to touch the piece and marvel at how textured it was. I hope these photos will give you a sense of its three-dimensional quality. The raised blue and gold lines, curves and spots on the condors’ cloaks give a lovely rippling effect and a sense of movement when the piece is viewed at certain angles. 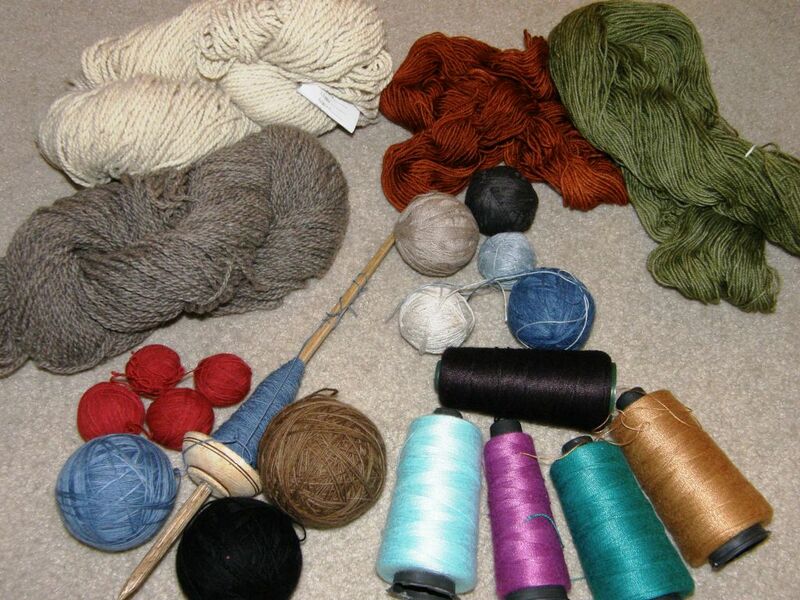 Yes, I would love to dare to put all these gorgeously rich colors together in one backstrap-woven piece one day! The reason for the trip to Northampton was an invitation to weave with a group of seven ladies. It was a lively, fun and chatty group. Most of the ladies already knew each other well. We did, however, manage a few moments of total silence as everyone concentrated on the business of pick-up weaving. We were, of course, all very envious of Kyla and her ability to sit cross-legged on her chair for hours. Kyla was the only novice weaver in the group. She is beginning her studies of floor loom weaving with Elisabeth Hill, the genius of deflected double weave, seated next to her in the picture. There was so much amazing weaving and dyeing talent in this group, I can’t even begin to tell you!!! Colorful inspiration in one form or another was brought each day…. Ute left these pieces with me over several nights to ponder and photograph. Maximo Laura and Leki Wangmo competed for space in my dreams! So, now that I have been back home a couple of days, I am using a combination of patterning techniques I learned in Guatemala, a new skill I picked up from a video of Leki Wangmo at work and the colors and motifs on the Bhutanese textiles to start to decorate that blank canvas of weaving on my demo warp. Now you see it, now you don’t! Yes, I have unwoven it all. 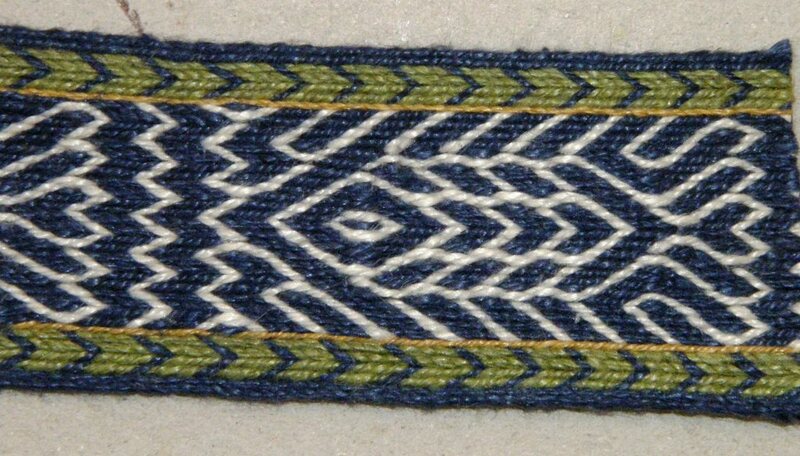 The weaving above was my sample and now I will weave with a different color scheme, ( see below), and modified layout. And as I write, I am getting ideas of how to use the fine silk I bought in the UK….and I think I bought a spool of red! But much practice is needed first. By the way, this white piece was giving me trouble with that pesky ridging. I know that a lot of you will know what I am talking about….that ugly corrugated look that often appears when using cotton for warp-faced textiles. I turned the loom around, wove an inch at the other end, turned the loom back around and started weaving again….ridging gone…yay! Something else that grabbed me and demanded to be woven while still on the road, was this band of pebble weave fish. Rob in the Ravelry group had asked me if I knew of any fish motifs for pebble weave. 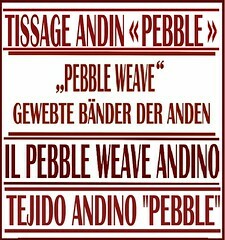 I did, but only the most basic kind…nothing more than a diamond with a triangle for a tail… which is on a weaving that I have from Taquile Island, Peru. Then, I met Marsha who came to weave with me at Pam’s place. Marsha makes amazing tablet-woven bands. 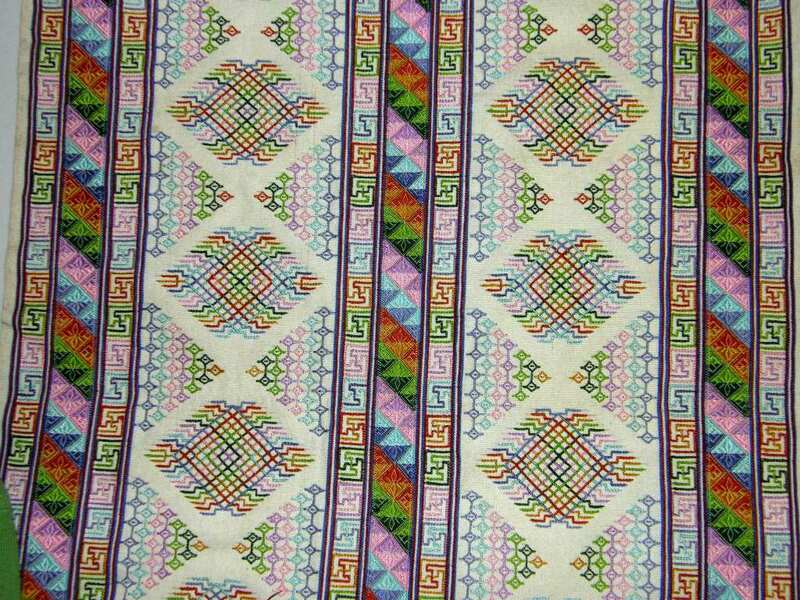 One of the many beautiful pieces she showed was a band of tablet-woven fish motifs which had been designed by Ursel Studemann. Once I was with my friends in Maryland, I got to work on my fish band. It was very easy to convert the tablet-woven figures to pebble weave. Gosh, it is so hot and humid here now in Bolivia, I can barely stand to look at this picture…sweater and socks in front of a fire with my warp anchored by my foot. One of the many things I love about the backstrap loom…so little loom waste. The band was started with a third selvedge and I wove to within inches of the end. Those are the warp end loops you see there and I was able to finish the fourth fish even with two sets of string heddles and the picking cross sticks between the weaving line and the end of the warp. So, Rob has a pattern for his fish project now. 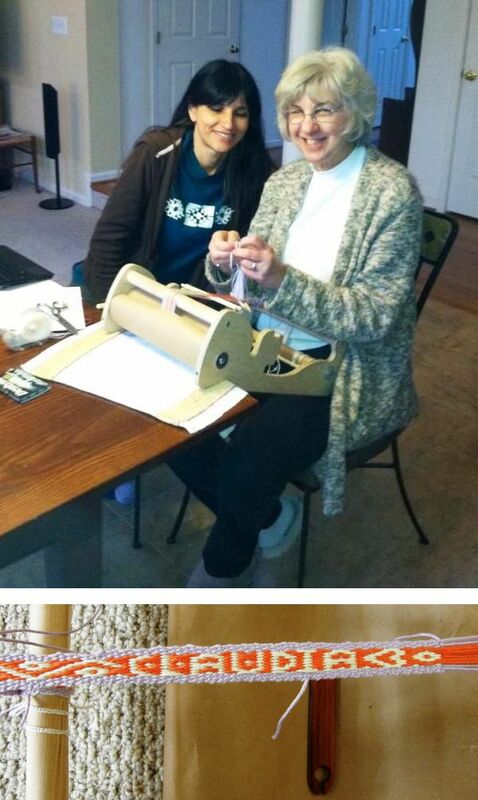 While in Maryland, Claudia and I got to play with pebble weave using the frame of her Cricket rigid heddle loom to hold the band rather than using a backstrap set-up. What a nifty little loom! 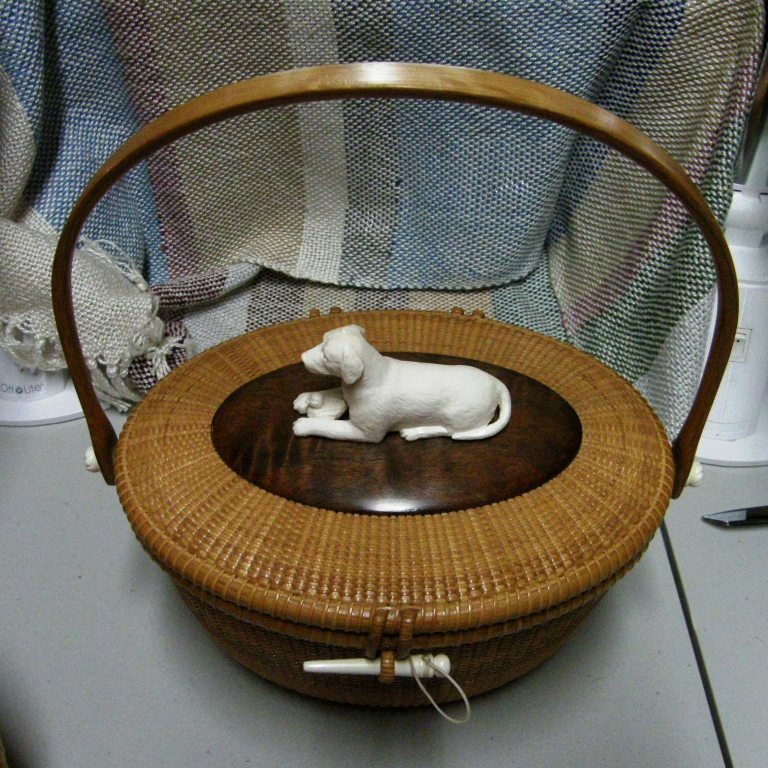 It was very comfortable weaving this way. When Claudia wasn’t at the loom I couldn’t resist messing around on it myself just for fun. I have never tried weaving letters in pebble weave but, with the few threads we were using, I was able to weave “Claudia”. I think I would need more threads to weave a decent “R” to weave my own name. Just a bit of fun. I know other structures that are better suited to lettering. Terri of Magical Moons (maker of very nice swords for backstrap weavers) spent some time weaving with me too. We played with complementary-warp pick-up on narrow bands. 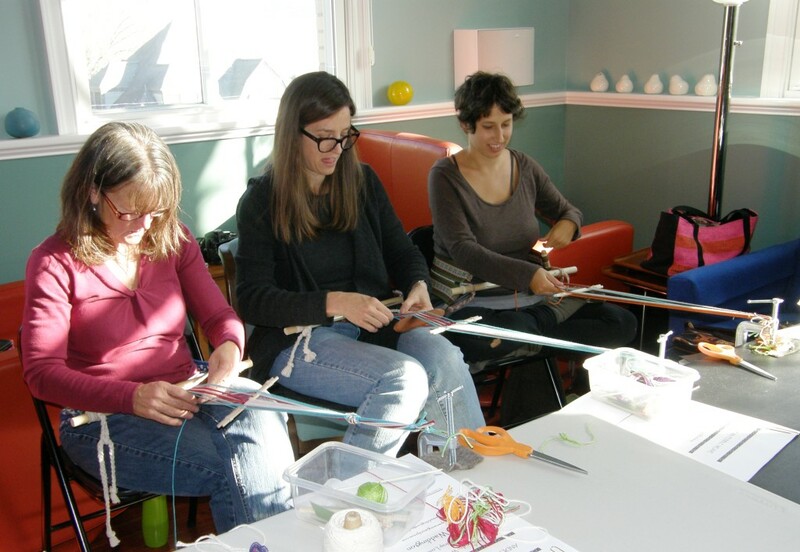 Some more backstrap weavers…On a day on our own, Laura is learning to make heddles for pebble weave. Diane and Kathie play with supplementary-weft patterning. In another group, Leslie and Holly, who have woven with me before, set up the warp and weave pick-up patterns using the intermesh structure. Carol, in Nicaragua, sent me these pictures of bands she has woven using charts and instructions from my two books. 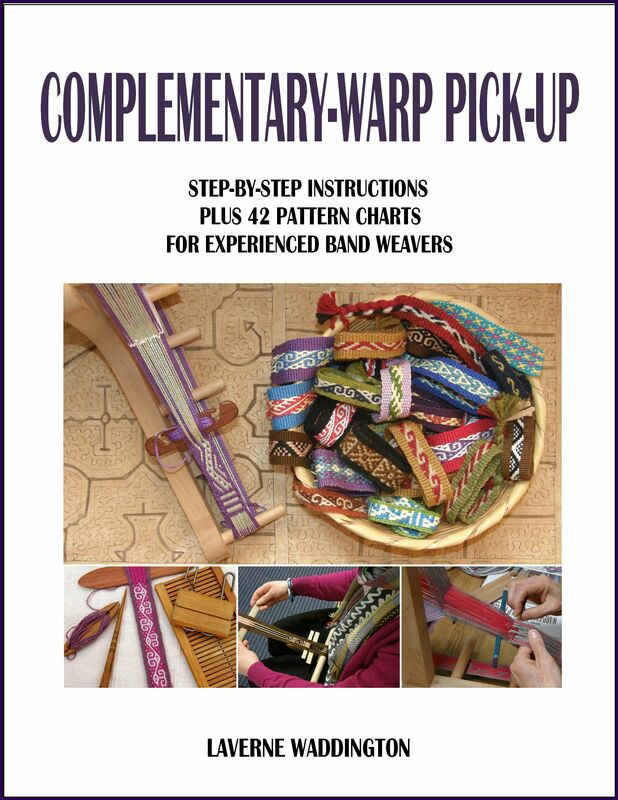 The first band shows the “Rolling River” pattern which is charted in my second book. It is a complementary-warp structure. 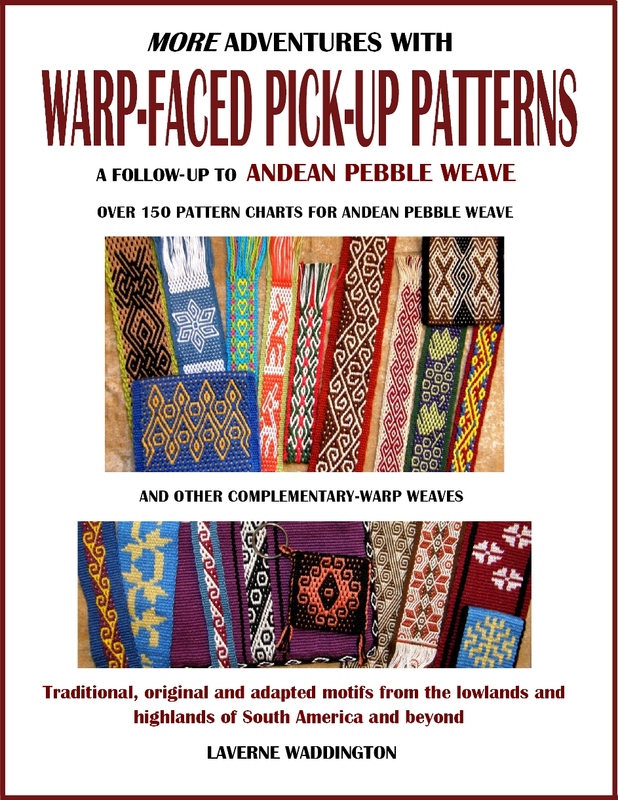 The second band, also a complementary-warp pick-up structure, which goes by the name of Andean pebble weave in my first book, has a pattern of my own creation. Rob, who is in our Ravelry Backstrap Weaving Group, has moved on to weaving with his own hand spun. The band on the left is the first using his newly acquired spinning skills. And that’s one of Terri’s (Magical Moons) swords. 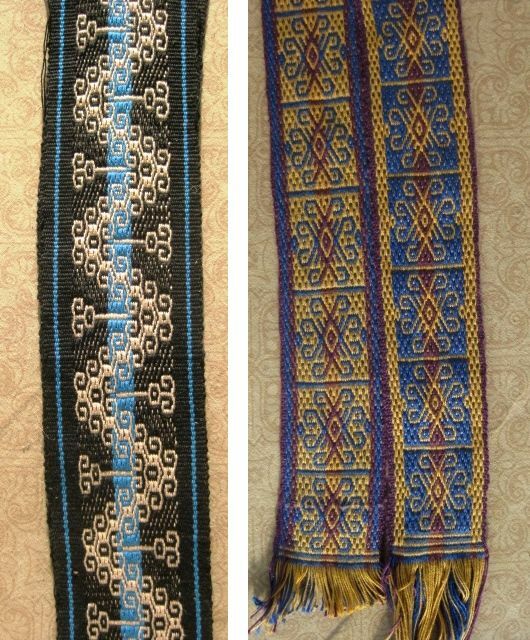 On the right is one of Rob’s pebble weave bands using motifs from Andean Pebble Weave. Well, it’s time to go and finish unpacking the swag, get all the ideas swimming in my head down on paper and attempt to get things back to ”normal”. It’s been quite an amazing year! Thank you everyone for making it so. 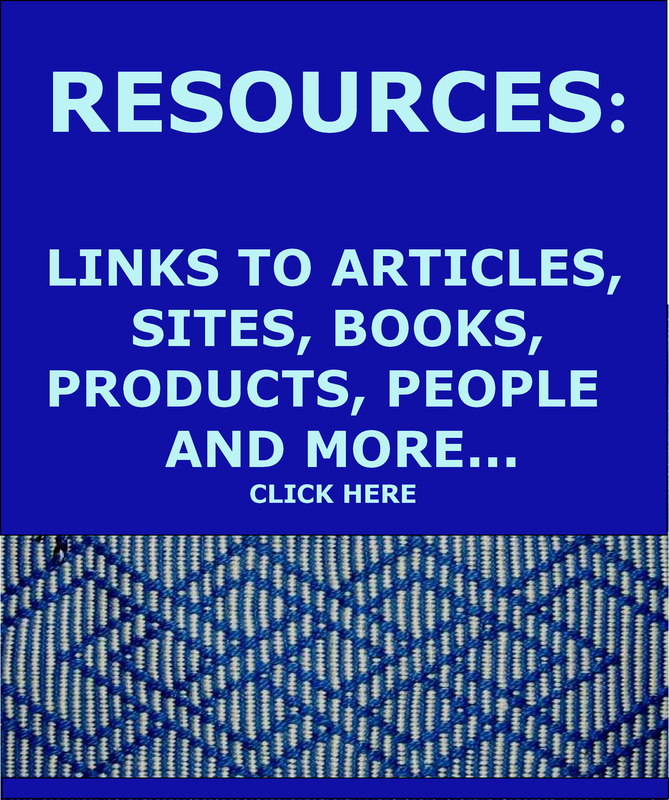 My blogs should also be appearing more regularly now! Hi! 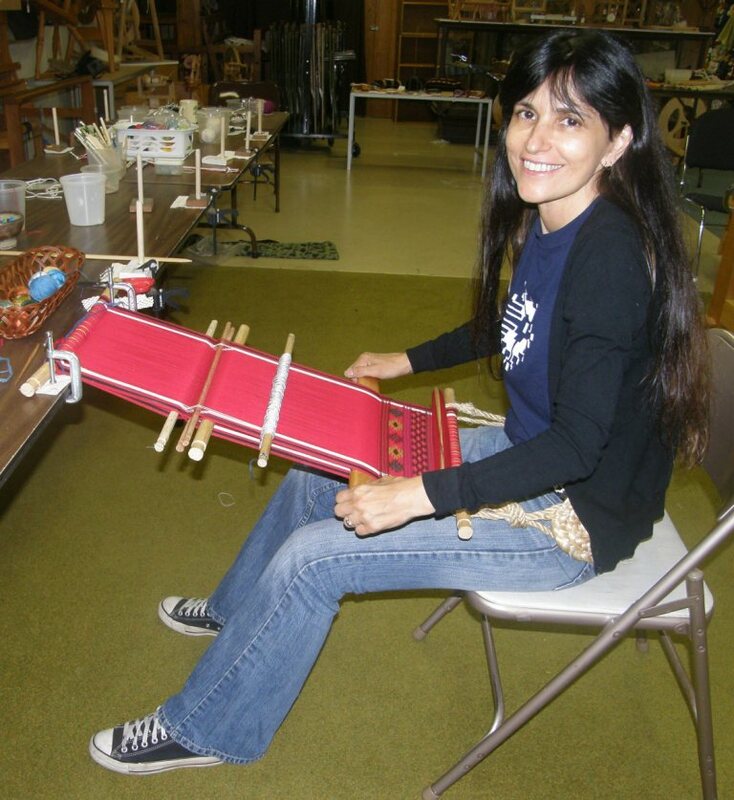 My name is Elvira and I live in Cajamarca, Peru… I’ve been trying to learn by myself backstrap weaving but it’s not easy without a teacher … I can’t still figure out how to move the heddle smoothly (been working with wool)… l love the pics posted on this. Thank you very much, Lavinia , for this interesting report and for the nice pictures! So inspiring! The weaving world is endless. Thank you, Laverne. I so enjoyed our time weaving complementary-warp pick-up on narrow bands. I look forward to your return to the U.S. so we can continue weaving together. Love all the eye-candy in this post. 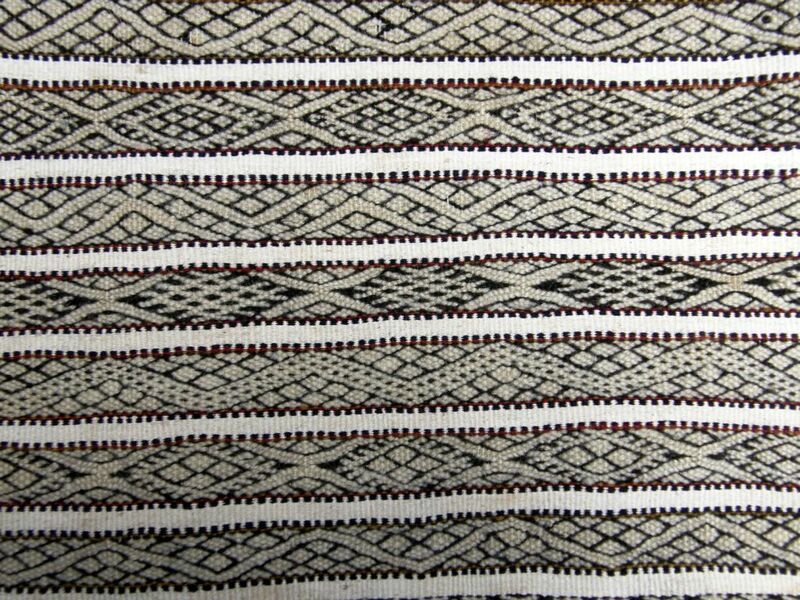 Such beautiful weaving! You always do such a wonderful job with you blog. Laverne thank you so much for the photos of Maximo Laura’s tapestry. And you could touch it ….lucky you. I got a reprimand from a museumgard in Berlin when visiting a castle there .I was pointing to an ancient tapestry to tell my friends that it was woven sideways. Apperently i went just a bit to near to it . I apologized to the gard and so i could stay. Always love reading about your travels. 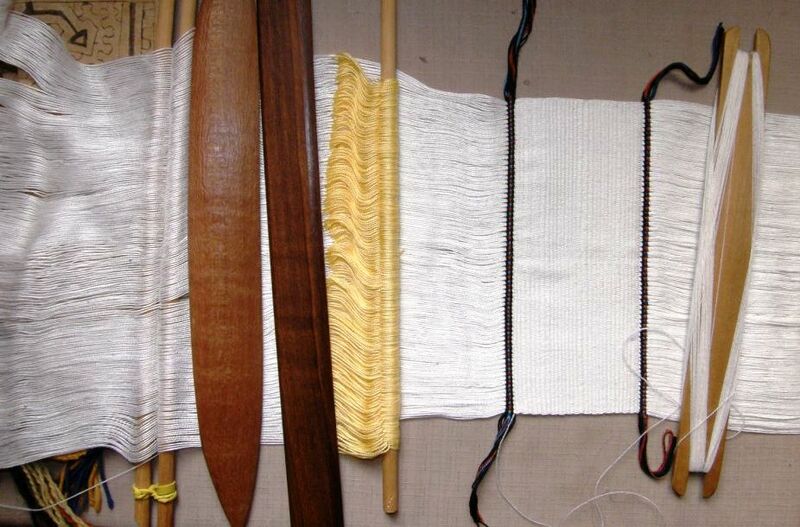 I have been learning tapestry weaving and just discovered Maximo Laura. What a treat to see a real weaving! You might be interested in this project, Coded Stories, http://codedstories.com/blog/. “The film follows artist Guillermo Bert, a Chilean-born, Los Angeles-based artist whose recent work was inspired by the similarities between Mapuche textile patterns and contemporary bar codes (QR codes).” The weavings are on display in the US, but will travel. I am loving the posts about your adventures. The pictures inspire me to get to work .